The aging process is not something that many of us take to lightly but as this is something that none of us are able to avoid, we must accept it and find the best possible ways to make the aging process a more graceful path. From the age of 25 our body’s ability to produce a good quality collagen slows, leading to a downhill decent as the years pass us by, this has a direct effect on the thickness of the skin. 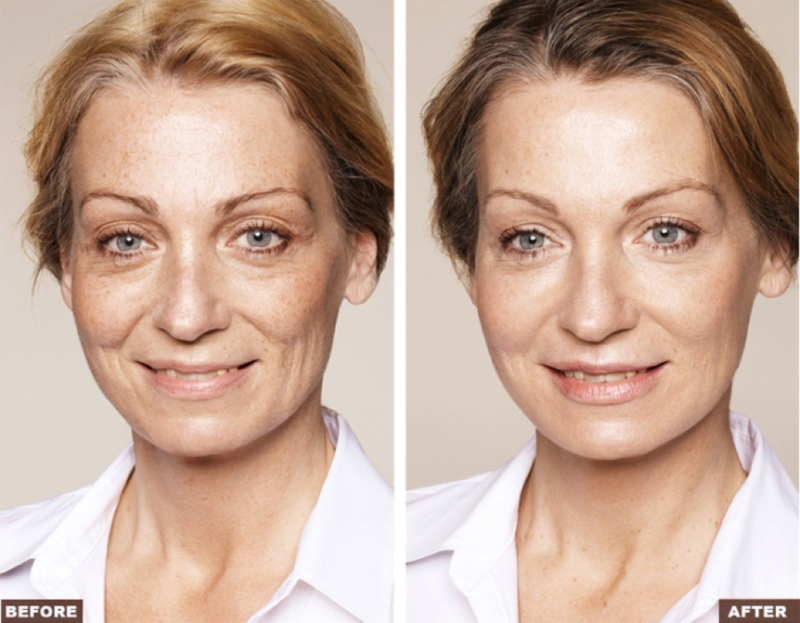 Sagging is often a result of this and enhances fine lines and wrinkles found on the face. In the late 1800’s shortly after the invention of the syringe, Injectable dermal fillers were experimented with and have since come a very long way to where they are today. Dermal fillers now offer a much safer and less invasive alternative to plastic surgery and are widely used by physicians all around the world today. Injectable Dermal Fillers incorporate the use of soft tissue filler that is injected into certain areas of the skin to assist in smoothing out facial wrinkles, fill in sunken in eye sockets and thin lips to provide a restored and more youthful appearance. What are the types of filler? This is the one of the most popular types of injectable fillers used in the medical aesthetic field. Hyaluronic acid is a humectant and can hold up to 1000 times its own weight in water, giving injected area a fuller and plumper appearance. These types of fillers are made in a lab and often provide a much longer lasting effect as the ingredients are not easily absorbed by the body. As the fillers are synthetically made some individuals can experience allergic reactions to some of the ingredients used. Collagen fillers incorporate the use of collagen in its purest form. The source of the collagen is typically bovine based as it is extracted from the hide of cows. The results from this form of filler however are short lived as the collagen is easily broken and metabolised by the body. Those with highly allergic immune systems could react to animal based fillers such as collagen. Allergies are usually disclosed during the consultation, allowing the DR to choose safer alternate filler. This form of filler is typically found within our own bodies. Fat is extracted from one part of the body and is then injected into another. This often requires 2 procedures as the first is done to extract the fat from an area with excess fat such as the thighs or stomach. The fat is then treated and then injected into the area being treated. These procedures are often performed on the same day. The results from this type of filler are semi-permanent. Injectable fillers are considered to be one of the safest procedures performed in the medical field. In very rare cases certain patients have been known to experience allergic reactions to some dermal filler that have been extracted from an animal source. However allergies are disclosed during your consultation with your medical aesthetic doctor, allowing them to choose a safer alternative, reducing the risk of an allergic reaction. Are Dermal Fillers painful to have done? Most injectables used today usually contain an anaesthetic agent such as Lidocaine. The numbing agent is often administered while the treated area is injected. It provides a fast acting action, making the treatment more comfortable. Alternatively a topical anaesthic cream/ointment can be applied to the area 30min prior to the treatment for those that have a much lower pain threshold. Temporary side of effects that immediately occur after having fillers done mostly include redness, swelling and bruising on and around the area that was treated. Small bumps/bubbles are known to sometime appear under the surface of the skin in certain individuals, this is often temporary and the body will re-adjust the fillers naturally over time. The effects of dermal injectable fillers typically last between 4 months-1 year. This often varies amongst individuals as each person’s body metabolises the filler differently. The benefits of having injectables is that they do stimulate your body to produce more collagen, thus benefiting you in the long run as less filler will be used over time to get the same effect as your initial treatment. 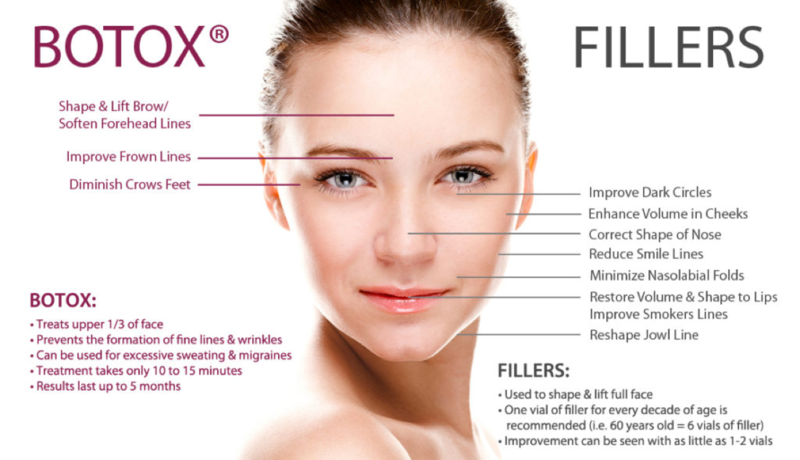 Botox vs. Fillers, What’s the difference? The two most popular injectable toxins done today are Botox and fillers. The one however is often mistaken as the other, visa versa. They are both used to create a rejuvenated and more youthful appearance but each offers a completely different effect to achieve such a result. Botox has direct effect over the movement of muscles, often found in the face and more commonly underneath the arms to control excessive sweating. By inhibiting muscle contractions this reduces the formation of lines formed on the face caused by constant movement of the skin. The treatment is minimally invasive and can sometimes cause bruising, which can easily be covered by makeup. The two injectables work hand in hand to deliver the best possible results; it’s never too early to start.